Christmas is a big celebration for families. It’s a great time of year for getting together with relatives to catch up over a big lunch, then sit by the tree to swap presents (if you haven’t done so already!). And whilst it’d be lovely to have a house full of people for Christmas dinner, you don’t always have enough room – or beds – to put them up overnight. It’d be a great shame if you end up not inviting loved ones over just because you live in a small house. There is an ideal solution to how to cope with relatives visiting you in Hemel at Christmas… Book your relatives into one of our serviced apartments. What they will get is an apartment that will sleep up to six people. They will also have the advantage of all the comforts of home in the form of a fully equipped kitchen (maybe they could even help you prepare the dinner without getting under your feet! ), free WiFi, Hypnos beds, Sky+ TV and a DVD player. They will even get free international phone calls so they can call friends and relatives around the world to wish them a Happy Christmas without worrying about the bill. If your relatives have young children, they don’t have to worry about them being in a different room – they’ill all be safely together in a one-entrance apartment. They won’t have to get everyone up and ready in time for breakfast – they can make their own breakfast whenever they like and eat it while still wearing their PJs! All our apartments come with a free parking space. An entire apartment is around the same price as a mid-range hotel room, so the more people you have staying it, the more you save! You won’t have to wash lots of sheets and towels before and after they arrive. Everyone in the family sleeps in their own bed. You won’t have to get up early to make them breakfast. No queues for the bathroom or cold showers for the last person in. 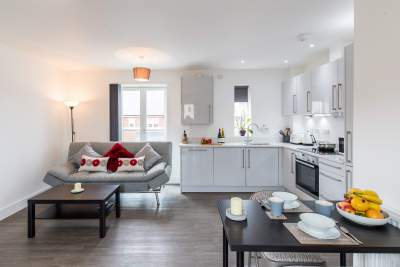 If you would like to book an apartment for visiting relatives, it doesn’t matter what time of the year it is, a serviced apartment is a cost-effective and comfortable way of accommodating them, ensuring that everyone is happy – including (especially) you! Click here for more details of all our apartments, check availability and book.